I really enjoyed this one… I like above-stairs/below-stairs stories, and have long been a firm believer in the old adage that “servants see everything” (or, more aptly put, “those who go largely ignored in society see more than they are given credit for”). There were just enough twists to keep things interesting, particularly when coupled with the behind-the-scenes social dynamics and interactions of early twentieth century New York. Jane is a great protagonist; she’s clever and underappreciated and just this side of naive in a way that made her a delightful narrator. The high society (established and nouveau) surrounding her was fun to witness through her eyes, and I liked the dynamic with Michael. 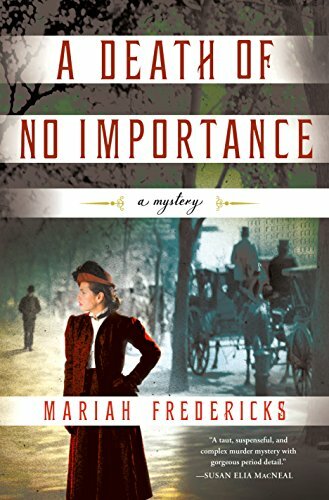 All in all this was a pleasant historical mystery with an entertaining and clever heroine, and I enjoyed it for what it was. I caught the throwaway reference to “other mysteries” in her life which I took to indicate that more books are coming; I say hooray to that, and am looking forward to seeing what befalls her next!